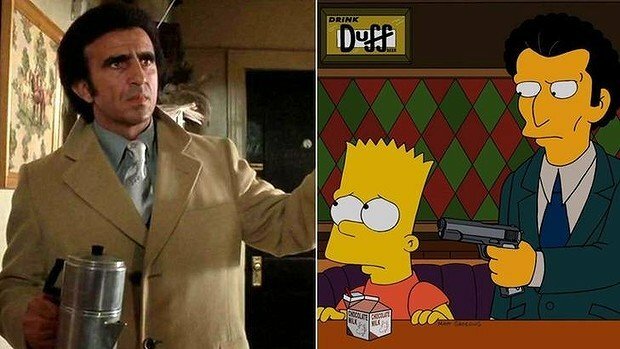 Frank Sivero has filed a lawsuit against Fox claiming The Simpsons character of Louie, a member of Springfield’s Mafia, was based on his portrayal of Frankie Carbone in Martin Scorsese’s Goodfellas. Legal documents have been made public on the gossip website Deadline. It’s 23 years since Louie made his debut opposite the cartoon’s mob boss Fat Tony. Now Frank Sivero wants $250 million for the alleged infringement. He claims he was “the originator of the idea and character” of Louie, as he based Goodfellas‘ Frankie Carbone on his own personality. In the documents he claims at that time, in 1989, he was living in the same apartment complex as James L. Brooks, when “they saw each other almost every day”. Frank Sivero also says he was promised a film and a part in the future of The Simpsons and claims he lost money because he was “type-cast” as a result of Louie. It’s not the first time this year Frank Sivero has taken legal action after claiming his rights to the Goodfellas character were infringed. In July Frank Sivero filed a suit against a Californian sandwich shop Deli Belly because they named an Italian-style sandwich “the Frankie Sivero” after he ate there.